Similar to the hypnotic effect that AC/DC music had on me when I first heard it (it was the LIVE Album “If You Want Blood, You’ve Got It” and it was, I believe, 1979), as soon as I set eyes on the photos of Angus Young embracing his Gibson SG, it was love at first sight, and certainly “Love at first Feel”. It’s a love that has continued to grow for about thirty years (even considering that I’ve tried far too many brands and models of guitars) the Gibson SG of the late ’60s has never left my mind since then. Photo A: one of my 1970 Gibson SG Standards. 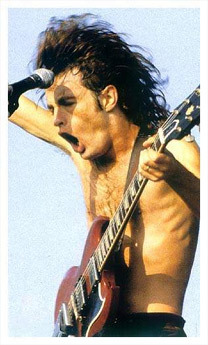 Surprisingly for many people, the 1970 Gibson SG is the production year most favored and appreciated by Angus. After some rather in depth research, (please see here) I was able to determine that the “Thunders SG” (Angus’ SG with the lightning bolt fret-board inlays) is of this same year (approximately: it could be ranging from late 1969 up until 1971). 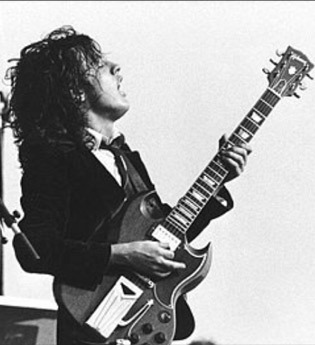 Thanks to old press articles and interviews I was able to determine that Angus Young’s first Gibson SG (and likely many others among his preferred ones) dated back to the 1970 model. These guitars, (as well as mine shown photo A), all sport the infamous “volute” at the base of the headstock rear side and Walnut color, just like Angus’ first Gibson SG acquired seemingly in 1970. 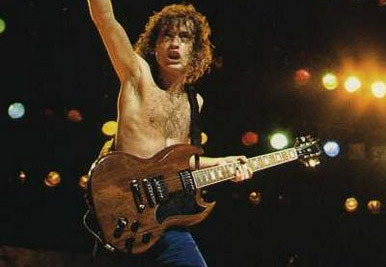 Above Photo (B): Angus playing a 1970-style Gibson SG with the volute clearly visible. (photo courtesy of a member of the LPF Forum). Photo C: 1967 Gibson SG Standard The change of specifications, AND appearance, between the early 1960’s SG style and a later one with the wider “batwing” pickguard happens around 1965/1966. In the above picture the original 1967 model (Photo C), is identical in most aspects to the 1968 model, however we can identify some differences from the 1970 style shown in Photo A. First, both cutaway carvings are deeper on the 1967/1968 model. This is just one of the many aspects one has to look into when trying to identify a correct date for these models (Gibson serial numbers of this period are among the most confusing ever made and often useless without other evidence relating directly to the guitar). Tone and Volume knobs on the Photo C model are clearly earlier style, becoming almost exclusively “Witch Hat” from 1968 on. The neck of this 1967 (Photo C) SG is fairly thin with a typical characteristic neck joint (FULL single reviews of these instruments to be posted here soon as “Instrument Reviews”). Photo D: Angus during the ’70s with a 1970 Gibson SG Standard. 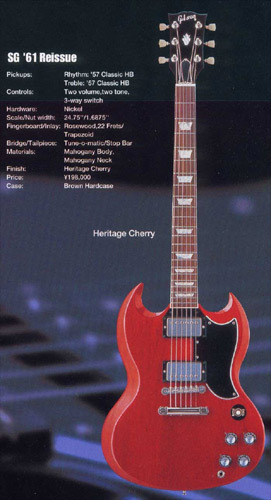 This would appear to be the second Gibson SG Standard purchased by Angus in 1978. Cherry Red. 1978 is the year when Angus retired his first and most beloved SG to use in the studio only. Let’s consider why I believe that the ability of the musician is not ultimately dependant on the instrument. However, consider also how many SG’s Angus has accumulated over the years, as the royalties came in he is said to have acquired a couple of hundred. Do you know why? this guitar has a “magical” influence on him for musical inspiration, both Angus and Malcolm are only too aware of this. So let’s talk about the instruments of these two guitarists. 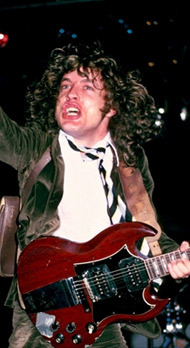 According to history, Angus began his musical career playing almost exclusively (except for accidental string breaks during a live show) a Gibson SG 1970 model. What a wonderful combination, lucky for him and for us all. This model is one of the many variations of design (and quality of MATERIALS) incurred since its first introduction in 1961. Gibson, during the late 50s, had in fact needed to revive its sales of solid body guitars, to counter the fierce competition of that time from the Fender Stratocaster. Their flagship model called the Les Paul (named after its endorser, a musician of the time born Lester William Polfus,), had already undergone several changes since its introduction in 1952. It may seem somewhat comical, but the Les Paul model was losing sales at that time to new guitarists tempted by other models apparently more innovative in appearance and ergonomics. We now know, in retrospect, that this fact certainly is comical, almost bitterly so. The Les Paul produced in the period 1958-1960 (known as the Les Paul Standard, finished in “Sunburst”) is now regarded, correctly in my view, to be the Holy Grail of electric guitars of all time . Consider that the value of a Gibson Les Paul in good condition, and original, now starts from U.S. $ 100,000 up to half a million dollars, depending on that condition and also its history. Only a few thousand were produced, and among those only a few hundred have survived today, some in a condition to attract large sums of money. However, it was not known at the time that those guitars would mark the history of rock as we know it today. Guitarists of the time had started to look for something different requiring Gibson to begin a re-assessment of the classic Les Paul model produced from the mid-60s. To meet these changing needs, Gibson then introduced a new model with double cutaways and a much lighter body. The double cutaways made the higher frets much more easily accessible and the slim neck “faster” to play. All-mahogany, it was released as the new model we know today as the 1961 Gibson SG. Initially also named after the previous endorser Les Paul but (after walking by a shop window and seeing one on display) he was so disappointed by it that he formally asked Gibson to remove his name. Let’s concentrate for now on the 1961 model. Cherry Red, complete with sideways vibrola, Gibson had tried to provide an alternative system of vibrato to compete with the Stratocaster. 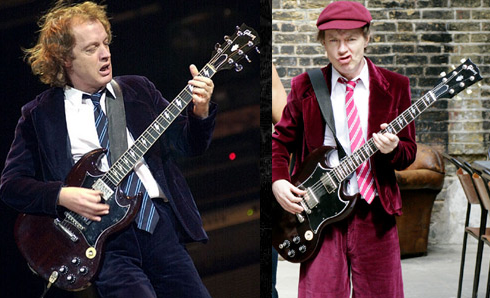 It’s known for a fact that Angus has owned (and probably still possesses) at least one SG ’61 / 62. 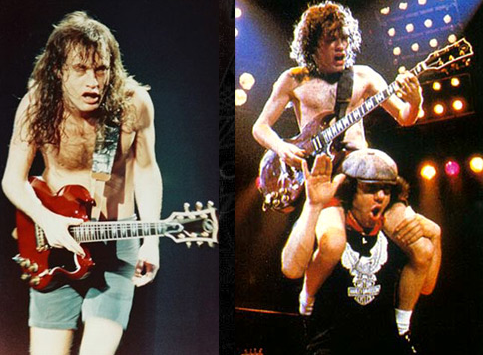 The only picture I’ve seen of Angus with this model of the original version with vibrola was at a show in 1980 (the date is shown on some pictures). It’s important to note that Gibson has also reintroduced a re-issue of this model (since 1986), without sideways vibrola that turned out to be really useless and even counter-productive for playability and reliability. The ’61 reissue is still on the market today, with the precise characteristics of neck and body etc. With the reissue, it must be said that the manufacturer makes a choice, the original Gibson guitars of the ’50s and ’60s were difficult to replicate exactly because of slight variations in measurements, particularly the neck. They are crafted practically, the choice for the reissue was made after observation of a number of original instruments and average measures agreed upon, rather than making an exact copy of any individual instrument. Photo: Angus SG model 1980 with 1961 (probably because the inscription dated 1961 Les Paul is still on the road copritruss). It should be noted that since 1980, when the band began to have real commercial success and therefore generating revenues, Angus began buying other SG’s, (he’s said this himself in interviews). At that time the information was not available to us as it is today. Angus had thought his ’70SG was nothing special at the time, just like many others. Only later did he realise, after buying and trying many, that his first guitar was indeed special. However, he continued to buy several more, probably intended as back up guitars for live use (in recent years on tour he takes some ten or so SG’s which will be discussed later). An example of one of those back up guitars (which are essential for live shows due to the possibility of broken strings or just because of the profuse sweating that Angus does running around stage) can be seen in the “Let There Be Rock” concert video recorded at the Pavilion Paris in late 1979. A black SG Custom, 70/71 production again (before the change of design), with a non-original white pickguard. This guitar has two pickups, not three as is standard for the Custom model. The third pickup (the center one) has been removed to set the guitar up for Angus’ style and tone, and not to leave an open hole a pickguard from the standard model has been used). During the early ’80s, Angus is seen with several different late sixties model SG’s, (’67 / 68 / ’69 / ’70) he’d collected many by this time. 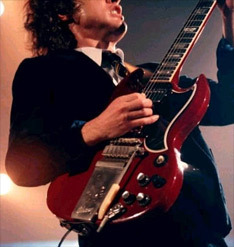 By the mid-80s he’d used many variations, including a built specifically for him Jaydee Custom Guitars (http://www.jaydeecustomguitars.co.uk/angus_young.html ) SG (see photo). The roadies were required to make many running repairs to the guitars as Angus live performance was harsh on them. The website states that Jaydee brought this guitar backstage at Donnington ’81 to show it to Angus who enthusiastically used it throughout the show. Watch the YouTube video linked just below. Photo: Angus 80s with a Jaydee Custom SG. Photo: Another Gibson SG Standard produced in the early 70s: this could be one of those rebuilt by Jaydee Guitars and currently used by Angus both for studio recording and live. Another possibility might be that Gibson has rebuilt his first and favorite guitar, adding the lightning bolt fret markers. From about 1986, Angus had a promotional contract with Gibson and they probably asked him to play a ’61 reissue on stage. From around ’90 he tended to use the same guitars and equipment for live shows and recorded work, giving consistent reliability and image for the supporting companies. He had a clear understanding of exactly which instruments he is comfortable with and makes a selection of vintage instruments from his collection regardless of the reference but with a preference for slim necks. The appearance of previously unseen SG’s, including a repainted black one, presumably a 1961/1962, and others possibly ’63 / ’65 models, with the small pickguard. Most of these have the vibrola system removed whether it be the sideways Lyre Master or the Maestro, except for one or two dating back to ’64. 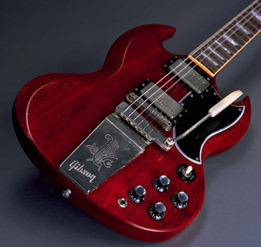 Photo: a reissue of the current Gibson Custom Shop, a replica of the ’64 SG. The reason for removing the vibrola is probably because these systems vibrated and were not very functional. They also introduced some instability of intonation, and slightly reduced sustain (the stop-bar being screwed deeply into the body transmits more of the string vibration i.e. increasing the resonance). Photo: an original 1964 Gibson SG with Maestro Lyre Vibrola removed (note the holes) and by adding StopBar, probably identical to those of Angus in my possession. Strings Much confusion revolves around the gauge of strings used by Angus. It is though a known fact, he’s said in at least two interviews, that he has primarily used 009/.042. Currently the brand is Ernie Ball, but it’s hard to say which brands he’s used in the past. It’s quite certain though that he has always used 009’s, given his physical stature and the size of his hands to get a vibrato and a touch like that has taken years of focussed practice and dedication. Having played with both 009’s and 010’s, investigated and tested many brands of amplifiers and guitars, vintage and new, I must say that I am opposed to the myth of the instruments themselves being an absolute necessity, i.e. particular brands and vintage in general. With that sentiment it is easy for those not having had the opportunity, as I have, (to try a lot of equipment and read about many others) to fall into the kind of negative thinking “without that type of guitar or amplifier, I will never sound good . Although I have stated clearly that early instruments had “magical” characteristics (particularly in some cases due to an excellent combination of materials, i.e. the alnico magnet, grade of mahogany or who knows what? Maybe even down to the individual talents of an experienced and dedicated Gibson employee on the day) the most important difference without a doubt is the level of sensitivity and personal skills of the player. All that is required is an instrument suitable to one’s own ability. As with AC/DC and rock and roll in general, this is intimately and ultimately linked to the sense of timing of the groove, a gift / talent innate in the player or to have been captured, as in my case, over time through years of practice). 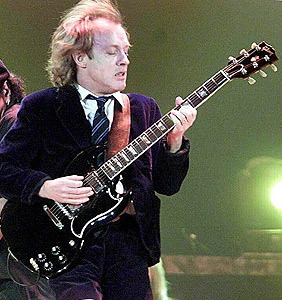 Marginally, characteristics of the instrument can be connected to the final result as undoubtedly they can lead to magical moments of unique inspiration because they stimulate the musician, at any given instant, to touches of brilliance (such as happened to Angus Young on certain occasions, both studio and live). So whether your guitar is an SG copy or a genuine Gibson SG, vintage or not, don’t be disheartened. You can still get a good sound and plenty of enjoyment from it (provided that the guitar in question has a good initial set-up or can be well set up, referring in particular to the action i.e. the height of the strings above the fret-board and other characteristics that define the “play-ability” of a guitar). In particular, I must add that from a quality aspect these popular vintage SG’s are also sometimes disappointing. With the SG of the late ’60s in particular, the quality of the finish leaves much to be desired (particularly when seen close at hand). The quality of the wood and pick-ups is absolutely nothing phenomenal. Of course, aging 40 years (in some instruments) plays its part. This might be the most fascinating feature of these vintage instruments. Some instruments indeed age just like wine, some good, others less so. Those that grow old “good” may be considered to be those in which all characteristics tend to blend as one in the instrument, i.e. vibrate together in unison, when the instrument is struck. The guitar in this way assumes a recognizable stamp, totally unique. You get a particular pleasure from some vintage instruments because the wood used has developed a smoothness and warmth and so on. I’ve also tried new Gibson SG’s and new custom shop models such as the Angus Young Signature, and I was pleasantly surprised. Indeed, the finish and materials appear in some cases to be better than a certain vintage. We must learn to choose, distinguish, and above all, to be able to assess. Firstly, always try to take the music seriously, any genre. Playing music has never been and never will be something “easy to achieve”, otherwise everybody would do it. If you want to learn to play, put the maximum effort in to push the boundaries of your possibility, just like AC/DC. I am sure that Angus Young has reached exactly the same conclusion over the years, and this I wanted to stress in these few lines. Would love to see a new Angus sig based on the one he used on the black ice tour. Thank you! The black one used on the Black Ice tour – in my research – appears to be a mid 1960s Gibson SG standard with vibrola removed and painted black. I believe it to be exactly around 1964-1965, so wider fretboard. I have one, and I can attest to its amazing “ease” of playability “butter” like. I am positive this is probably Angus’ number one choice for this. Now, if you want a close replica of this guitar, Rock N Roll Relics does a similar one, but the dimensions are basically the same. You just have to ask for the smaller pick guard and black paint. talking about the Black one ( I wanna call her Blackie ), is it the same he used mostly for the Razors Edge tour, and Ballbreaker ? The trussrod cover say Les Paul on Razor And Ballbreaker. 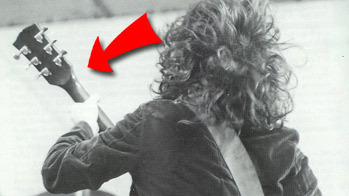 Kinda hard to see the Les paul writing on Donnington , but i think it is there. Also Grover/schaller type tuners. On river plate there’s blank TRC and regular Gibson tuners. But he might got new tuners and lost his TRC before Black Ice tour. Got a pic from the 91/92 tour with Blackie and there’s the cover with LesPaul on it. And tuners are like you said, Grovers. If the Trussrod cover is original, the Donninington ’91 and No Bull ’96 should be a 1961-63 sg. Like Fil says the Live at River Plate Sg should be a 1964-65. It could be that they are the same guitar, with minor changes (much likely). The giveaway could and should be the Gibson logo in the center (i.e., how it lines with the tuners on the sides – it should be at the same height in all the pictures we see of it – and rather high – meaning it is an early to mid 1960s SG Standard). This is mainly important for one reason: it confirms Angus’ change of mind on necks, now preferring wider, early 60s style as opposed to the super thin and narrow of his original and initially preferred late 60s SGs. does Angus have his pole screws on the pickup adjusted on the guitar in any manner? what about the SG juniors Angus has been pictured with off stage? The very last picture, that’s a 79/80 SG. The toggle switch is in bewteen the knobs.